Magnesium (Mg) is one of nine macronutrients and is taken up by plants in quantities similar to that of phosphorus (P). 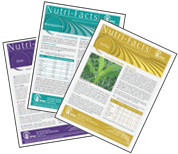 Nickel is the most recent element to be added to the list of essential plant nutrients. Potassium (K) is an essential plant macronutrient taken up in large quantities, like nitrogen. In plants, K does not become part of complex organic molecules. It moves as a free ion and performs many functions. Selenium is not an essential nutrient for plants but is required for many physiological functions in humans and animals. Soluble sulfate is the primary source of S nutrition for plants provided by the soil.